I have a little confession to make. Yes yet another one. Although I have a few of Linda’s books on my ever increasing ‘to be read’ mountain, I haven’t actually read one…………..until now that is. As characters, I really did feel for Erin and Vicky, who tragically lost their parents much too soon. Following their parents’ death, both were brought up separately and consequently their relationship suffered greatly. Erin was literally a babe in arms when she lost her parents so she hasn’t really got any memory of her parents and to her, the woman (Sylvie) who took her in or to look at it another way who was her abductor, is her mother. Erin was with her parents the night they went to a reunion but she was saved from the fire that killed her parents. Vicky was staying with her Auntie Maisie whilst her parents were away. Following the fire, Vicky remained with her Aunt but she didn’t seem to remember that she had a sister. It was as if her mind was blocking Erin out. If I could have jumped inside the pages of the book to give both children a hug then I would have done. I took to both characters from the start. Fast forward a few years and Vicky discovers that she does have a sister and sets out to find her following a deathbed confession by her elderly aunt. There was one character who I could have slapped silly with a wet flip flop and that was Sylvie, who abducted Erin and brought her up as her own child. Sylvie was very manipulative, selfish and self centred. That’s how I took her to be. Will Vicky find her sister? What happens to Sylvie? Will this book have a happy ending? Well for the answers to those questions and more you are just going to have to read the book for yourselves to find out as I am not going to tell you. 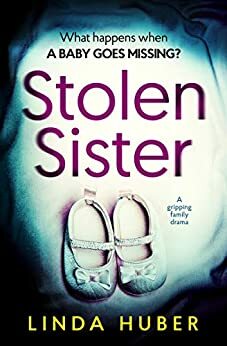 ‘Stolen Sister’ was one of those books that had me on the edge of my seat throughout the story. I just wasn’t sure how the story was going to pan out and so I had to keep reading on and on and well you get the point. I felt compelled (in a nice way) to read on. I was desperate to know what happened and so I carried the book everywhere with me because I just couldn’t put it down. I binge read the book over the course of a day or two and this really helped to ramp up the senses of tension and drama. On more than one occasion I thought that I had fathomed out what was going to happen and why, only to realise that I had the wrong end of the stick completely and I was sent down another path entirely. The author has a writing style that draws you in and has a hold over you. That’s what happened to be. She writes so realistically and convincingly that the characters seemed to spring to life and jump off the page as it were. I began to think of the characters as being just as real as you or I. I even found that I was interacting with the book. I know it’s a work of fiction but if I immerse myself in a book, then I tend to live the story as if it is real and I randomly ‘talk’ to the book as if the characters can hear me. Reading this book was like being on a rather scary and unpredictable rollercoaster ride with no idea in which direction the story is going to take you next. I also found that ‘Stolen Sister’ messed with my head a fair bit. That’s not a bad thing as I love psychological thrillers that mess with my head. I would definitely recommend this author and this book to other readers. I will most definitely be reading her other books just as soon as I can. The score on the Ginger Book Geek board is a very well deserved 4* out of 5*.